Unleash your inner artist with Double Da Vinci Diamonds, a 5 reel, 40 payline slot developed by IGT. Double Da Vinci Diamonds is the exciting sequel to Da Vinci Diamonds, but it's a bigger and better masterpiece! The design is very colourful and replicates an art gallery of some of the most famous paintings in the world like the Mona Lisa, painted by Leonardo Da Vinci. If you're a creative person or an admirer of great art, then you will enjoy this slot. To win big in this slot, you have to crack the code and guess the prices of these incredible pieces of artwork. What lies behind the paintings you may ask? Diamonds! Lots of diamonds. Double Da Vinci Diamonds comes with a great set of features including split symbols, tumbling reels, and a free games bonus round. To unleash your inner artist, play slots online at this link. IGT is one of the leading online casino operators with the aim of providing gamers with an exciting and unique experience. They create games across all channels ranging from digital to gaming machines and social gaming. Every IGT slot is filled with cutting-edge technology, premium entertainment, stunning artwork and fantastic gaming solutions. IGT currently has 100's of slots to offer game players and work every day to bring out new and entertaining slots. They have a range of games varying from sweet games like Candy Bars, slots based on popular TV shows like Family Guy and adorable fairy-themed slots like Garden Party. 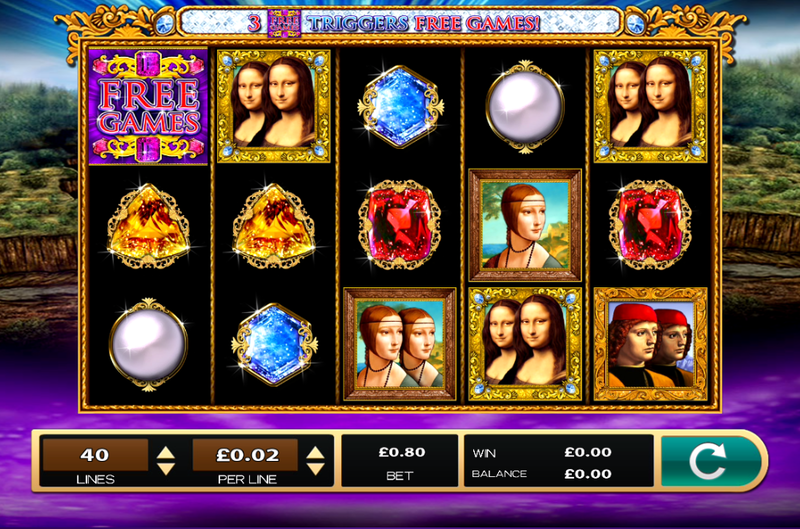 If you enjoyed Double Da Vinci Diamonds, why view slot games online here? Double Da Vinci Diamonds is an art-themed slot with 5 reels and 40 paylines. Its arty theme certainly offers something different compared to all of the fruit/Egyptian/oriental themed slots out there. Double Da Vinci Diamonds is a highly enjoyable slot and by the time you have finished, you'll want to get your paints and paintbrushes out. The design looks very expensive, with golden framed reels with sparkly diamonds encrusted at the top. The symbols include a variety of paintings by the infamous Leonardo Da Vinci such as the Mona Lisa and a range of beautiful gems including shiny pearls, bright red rubies, and shiny sapphires. You may want to read our guide to help you choose the best online slots you can play. Split Double Symbols - The spit double symbols are the two symbols in one. It's possible to spin 10-symbol combinations with this offer which means there are lots of exciting prizes on offer if you manage to find one. Keep an eye out for the double Mona Lisa symbols as these are the highest paying in this feature. Landing a 10-symbol Mona Lisa combinations will award you a massive multiplier of 5, 000x. The Wild Symbol - The wild symbol in this slot is the pink diamond 'WILD'. This replaces all other symbols on the reel apart from the free games symbol. The wild is also considered the same as a split symbol which increases your chances of winning even bigger and better prizes. Tumbling Reels Feature - Every time you form a winning combination, you will have access to the tumbling reels feature. The winning symbols will be thrown off the reels and will be substituted with symbols directly above the reels. The Free Games Feature - Unlock the free games feature by landing the same symbol on reels 1, 2 and 3. Once activated, you'll be given between 6 and 16 free spins. Double Da Vinci Diamonds is the exciting sequel to Da Vinci Diamonds. The design is very elegant, showcasing some of the best artwork of all time. 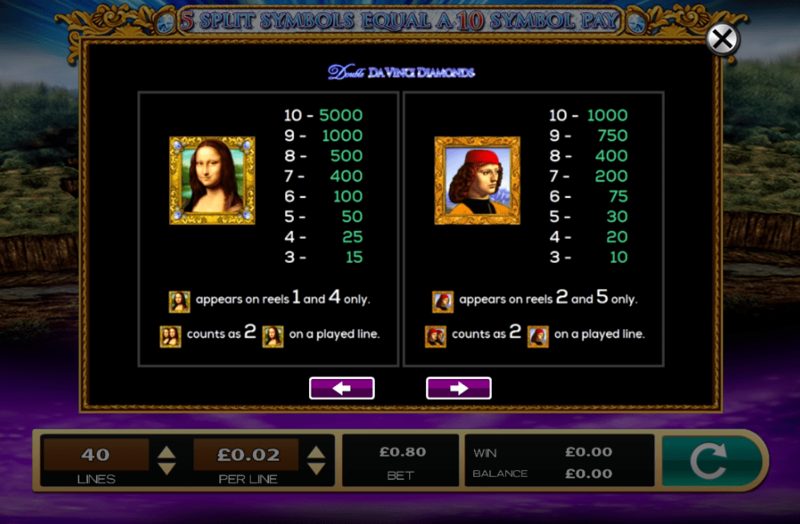 The features are all great, especially the split double symbols where you can boost your winning by up to 5, 000 times! Or head deep into the forest with Secrets Of The Forest.